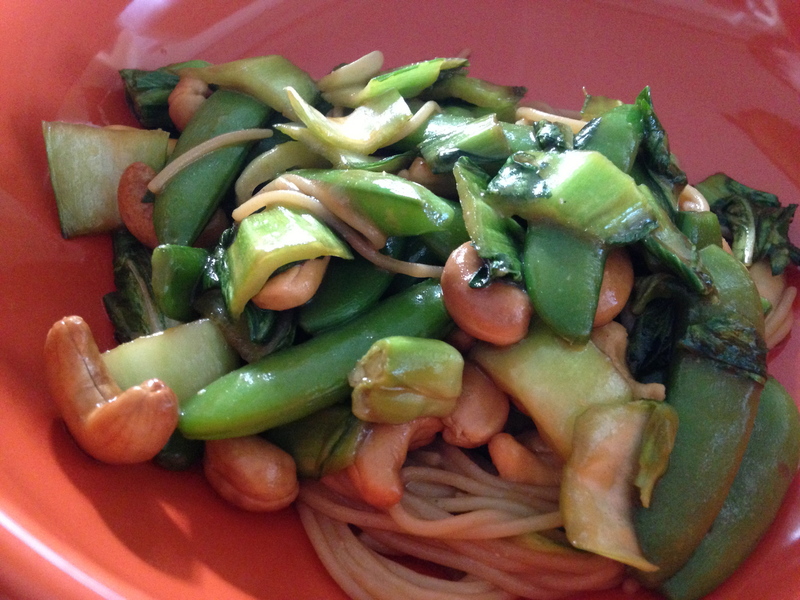 When I got the bok choy and snap peas from the CSA this week, I immediately thought Chinese food. So I pulled this one together with staples I had on hand and voila, din din quick. Get the pasta going. Roast the cashews in a 350 oven for 7 to 10 minutes or until just browning. Cut the bok choy into chunks. Prep the sugar snap peas by cutting off the stem end. Whisk all of the marinade ingredients together making sure the arrowroot or cornstarch is dissolved. Place the bok choy and snap peas in a pan with sides. Add the marinade and cook until the bok choy has wilted and the snap peas are bright green. The sauce will thicken a little. Add the cashews. Drain the pasta and add to the pan. Toss well. Enjoy!